Artist rendering of World Oil’s Sunset Plaza, approved for construction at Voltaire and Sunset Cliffs Blvd. World Oil needs an extension. 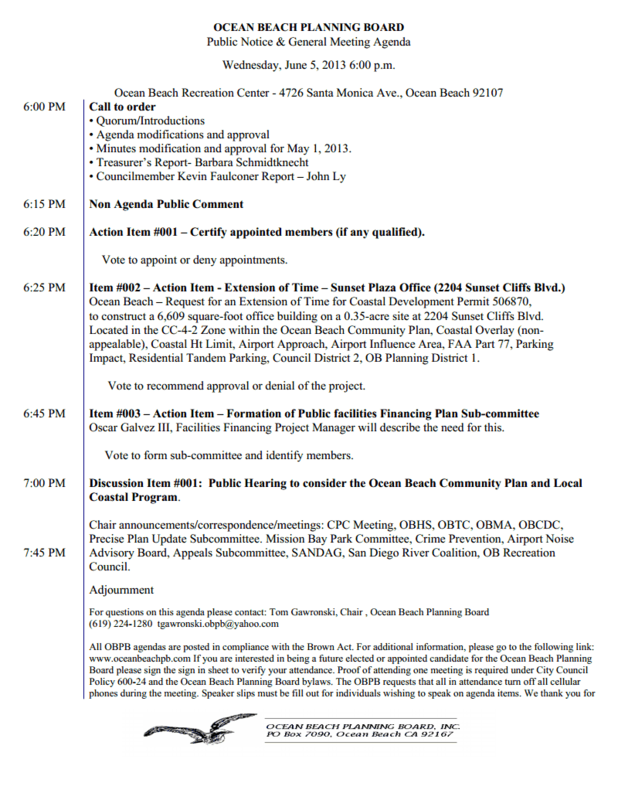 Here’s the agenda for the OB Planning Board’s monthly meeting on Wednesday, June 5th. The Board meets at 6pm sharp at the OB Rec Center, 4726 Santa Monica Avenue. On Wednesday’s agenda, besides the usual reports, are two items of interest. The first item of interest is an action item, a request by World Oil for an extension of time for their Coastal Development Permit that allows them to build a 6609 square foot, two-story office building at the corner of Sunset Cliffs Boulevard and Voltaire Street. The corporation years ago was approved to construct what they call the Sunset Plaza, but have yet to move on the development at the site of their one-third acre of prime OB property. They did purchase the Dover Plumbing lot – and both parcels have been boarded and fenced up for years. NOTE: They need the extension not necessarily for themselves but for whomever they can sell the property and plans and permit to. For the property is up for sale. That particular corner has a weird and controversial and contentious history. A decade ago, a community group, OBGO, took it upon itself to clear and clean-up what had become World Oil’s dumpsite and put in a park-like setting with trees, bushes, flowers, and paths. After a couple of years of working with OBGO, World Oil came in and overnight destroyed the garden and threw up a fence. Subsequently, they achieved OBPB approval for their unsightly “medical building” – a disastrous concoction of glass and stucco. The corner lot has been fenced for years, accumulating political signs, trash and weeds. It’s expected that City planner Maxx Stalheim will be asking the Planning Board for its “feedback” of what has been presented as the Ocean Beach community plan update. Copies of the update document will be handed out by Stalheim to Board members only – and not to the public. Stalheim told the Peninsula Beacon that even though the update will be discussed in public, audience members won’t be able to view it. “We simply don’t release draft documents before they go out,” he told the Beacon. The update goes to the San Diego Planning Commission next on June 20th. The update will not be available to the public online or until its at the OB Library on July 12th. I hope they deny the extension and start over. What an ugly building?? Yeah that’s just wrong. It’s built right up to the sidewalk at street level and then there’s an overhang on top? Should be set back- and where’s the parking? In back? Parking should be in front with a barrier of vegetation along the public walkway and the structure set far back from that. I’m sure the architect put some work into this but he should have put a little work into looking around our community first. Looks like job #1 was maximizing floor sq. footage. A place to provide primary medical care for OBceans, including our homeless, would be good, but not in that ugly POS building. Make them propose something that fits OB! 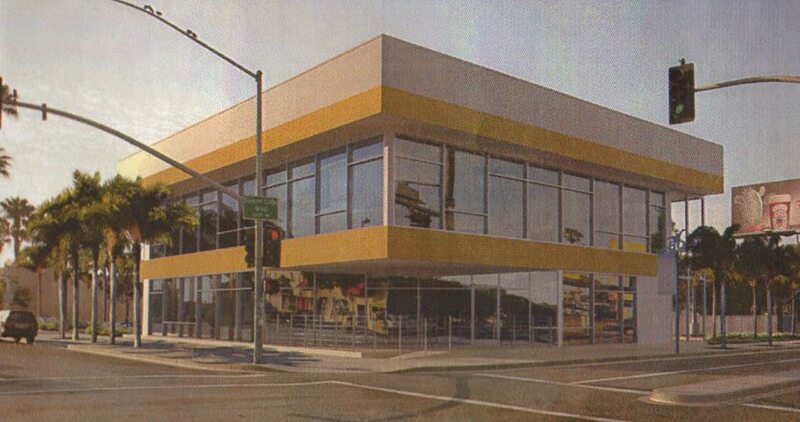 It should be noted that, as a result of prior reviews by the OB Planning Board, the applicant has modified the building’s appearance to address aesthetic concerns and produced a new visual rendering. This newer rendering should be available at tonight’s meeting. In addition, at the Project Review Committee meeting on May 15, the applicant’s representative stated an intention to begin grading and other preparation work on the site this summer. Hopefully this will be confirmed at tonight’s meeting as well. I am OK with the aesthetics of the building, am glad not to see a big traffic generator, and am far more concerned about all the illegal (no parking provided) (re)development on the 4800 block of Voltaire St. I also am quite concerned with the secretive, uncooperative attitude of City staff in illegally frustrating public participation in the land-use-plan-update process. Staff needs to be exposed and punished. Mr. Burns – In what ways do you believe that city staff have blocked public participation in the update process? For better or for worse, the plan has been in the update process for several years now, and over that period I can recall numerous public meetings being organized by city staff to solicit community input. In fact, most of the work on the update has been performed in collaboration with the Precise Plan Update Committee, a group of volunteer citizens whose meetings are attended by city staff and open to the public. In addition, several public meetings were also held on the plan’s associated EIR. With you there, although I do think it has had more to do with City leadership than City staff. Part of it was the recent budget shortfall that created a priority for revenue generation and rubber-stamped development, but IMHO, the bigger issue was that until recently, the City leadership placed no importance whatsoever on community planning, and truthfully, were actually rather hostile to the whole idea of it. Excuse you, but I said “frustrating” not “blocked” and explained how. I served many years on, and chaired, the O.B.P.B. and find the behavior unprecedented. Who are you? He didn’t surround the word in quotation marks so consider his paraphrasing a summary. More importantly it seems you have levelled some serious allegations against public employees, if you have substantiating evidence to support them I’m sure I’m not alone in saying I am salivating in anticipation of seeing it. Let’s please try to remain civil here. I’m the current vice chair of the Planning Board, and I’m interested in learning how you believe the city staff have “frustrated” public participation. You didn’t actually explain how. You just made a vague statement that they have been “secretive,” “uncooperative,” and “should be punished.” But that isn’t very specific. In my admittedly limited experience with the update process, I have not seen the type of behavior from city staff. In fact, I have witnessed quite a bit of public participation taking place between them and the community. I’m just curious what experiences you have had to the contrary. Peter, my experience is that many people are not happy with the City not releasing the document in draft form. That in itself is a justifiable decision to me, however, when the City on the whole (not the staffers in question, IMO) generally operates without transparency in some fairly questionable ways over an extended period, a climate of mistrust is perfectly understandable. With that said, I have seen this draft plan update fairly recently, and think it is a good document that has had an extensive amount of public participation. I hope it gets passed soon and “enforced” by all parties. What would be the sale price if a community drive was initiated to purchase the land and revert it back to a garden or small park? Sorry about my brevity then on a cell phone; it’s not as “smart” as the corporations would have us believe. The behavior I call “unprecedented” was that of the City staff. How City staff frustrated public participation, I believe, is obvious from the article above (very similar to what I already read in the U-T). It says that the is an ongoing LUP-update process going to the Planning Commission in only 15 days yet “[c]opies of the update document will be handed out by Stalheim to Board members only – and not to the public . . . [and] audience members won’t be able to view it.” Yes, that is obviously a frustration of public participation unless one believes that the public should participate only through the public’s representatives. I’m sorry that you are frustrated with the review process for the draft plan update. But rest assured, the public will have ample time to comment and propose edits to the plan before its adoption. As explained by City staff at Wednesday’s meeting, the draft is being officially released to the public for a 60-day review and comment period on July 12, and it actually should be available for download on/about June 14 as part of the Planning Commission agenda. The City provided the document to OB Planning Board members this week as a final step in what has been a lengthy internal review process. I believe that is a justifiable action (as does Seth above). In addition, the public has always been welcome to attend the regular meetings of the Precise Plan Sub-Committee, at which preliminary draft copies of the document were available for review and comment. Regardless, everyone in the community should be able to review the document very soon – hopefully within a week. The OB Planning Board will post it online (oceanbeachpb.com) as soon as it is available, and we encourage you to attend our next meeting on July 3 to share your thoughts. Well, that’s quite a relief. I had no clue of that from the OB Rag coverage which mentions only that the matter goes to the Planning Commission on 6/20/2013. I would like to review it when it is on line and would like to attend the July 3rd meeting. Thanks.